Located in the heart of Amish Furniture Country two miles west of Mount Hope, Ohio, Mullet Cabinet is leading the way in custom cabinetry. Since 1975, we have been creating handcrafted custom cabinetry and providing exceptional customer service, and we are carrying on that tradition today. Bring your ideas, we provide the inspiration. Show us your dreams and we’ll create a reality. 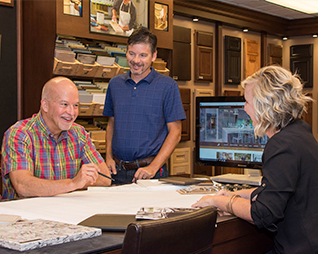 Our Custom Cabinet Design Center features the latest in style and color inspired by the nation’s top designers. Custom cabinet design that’s fabulous and functional. Details both distinctive and understated. Vibrant colors and subtle hues. Storage that’s simple and ingenious. The Cabinet Design Center is where all the pieces start to come together, where the pictures in your head become the heart of your home. When we blend your individuality with our creativity, the result is a perfect space to celebrate all that makes your family special. That’s what custom cabinet design is all about. And it’s all here at Mullet Cabinet. Why not come and see for yourself? Our hours are Mon-Fri 10:00am – 3:00pm and Sat 9:00am – 12:00pm. Call 888-333-3594 today to schedule an appointment. 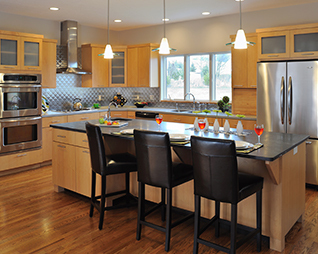 At Mullet Cabinet, we promise to provide top quality custom cabinets, countertops, design, and customer satisfaction. 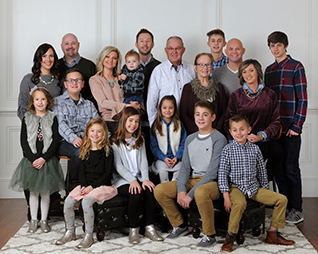 We are guided by our heritage as a third-generation family business, passion for the work environment, and dedication to integrity and respect. You can depend on cabinetry uniquely built for you to the highest standards, ready to last a lifetime and backed by the Mullet Family Promise Guarantee. Don’t just take our word for it… see what our customers have to say! Check out our Customer Testimonials here. The heart of the home, the center of family life, your kitchen deserves custom made cabinets, cabinetry that helps you organize, cabinetry that says “home” to you. Custom made cabinets gives you every option in any style, whether you are remodeling or building. You can choose the latest in design, innovative organizational elements and finishes from warmly classic to refreshingly new. Custom made cabinets make kitchens, bathrooms, home offices, laundry rooms, media rooms and other areas bloom into wonderful spaces. We realize that your new kitchen is about more than cabinetry. Located in the rolling hills of Amish Country, Mullet Cabinet relies on old-world craftsmanship, which leads to sound construction and attention to detail. It’s about celebrating family life with a bright new space that brings you joy for years to come.